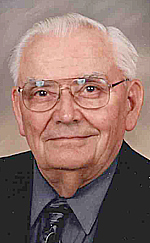 SLEEPY EYE — Armin Losleben, age 90, of Sleepy Eye died on February 6, 2019, at Sleepy Eye Care Center. Visitation will be on Monday from 9 to 11 a.m. at St. Mary’s Catholic Church, North Entrance, Sleepy Eye. Service will be held at the St. Mary’s Catholic Church, Sleepy Eye, on Monday, February 11, 2019 at 11 am. The clergy will be Msgr. Eugene Lozinski. Interment will be in St. Mary’s Catholic Cemetery in Sleepy Eye. Armin Robert Losleben was born on the family farm northeast of Sleepy Eye, Brown County on July 16, 1928 to Arnold P. & Theresa (Fischer) Losleben. He attended District 21 Country School and St. Mary’s School. Armin then attended School of Agriculture for 2 years. This is where he learned to weld. While farming, Armin was creative, inventing and making things to fix problems. He created his own float system for a water trough. He created a silo pipe in the chimney to prevent smoke backing up in the stove. He married Lucille Spaeth on May 23, 1950 in Morgan. They moved to a farm west of Essig. Armin and Lucille joined a square dance club and traveled around the state to dances. They were members of a bowling team in a couple’s league. They remained on the farm until they retired from farming in 1984 and then moved to Sleepy Eye. Armin was a life time member of St. Mary’s Catholic Church. When his son, Rick, passed away in 2010, Armin volunteered to mow the grass in St. Mary’s Catholic Cemetery to be close to Rick. He was a member and treasurer of Sleepy Eye Shipping Association and the Knights of Columbus. He loved farming and also enjoyed woodworking, old tractor equipment, carpenter work, cards, old time and country western music. His favorite past time was having morning coffee at Carl’s Corner in Essig “solving the world’s problems” with former neighbors and other farmers.